WILMINGTON, De. (CNS) — Gary Morton, longtime editor and staff writer of The Dialog, newspaper of the Wilmington Diocese, died Sept. 29 after a brief illness. He was 68. A funeral Mass was celebrated at Resurrection Church in Wilmington Oct. 6 followed by a private burial. Morton, a Texas native, who came to work at The Dialog in 1996, was described by many as the Southern gentleman of the news operation for his easygoing and likeable ways. He spent 50 years in journalism, first working in mainstream news with the Fort Worth Press, Waco Tribune and Abilene Reporter News. He then aligned his work with his faith, working for The Florida Catholic and The Dialog, diocesan newspapers. 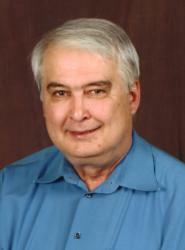 He was a longtime member of the Catholic Press Association. He was also a contributing writer in the development office in the Wilmington Diocese. Morton was devoted to his faith, family, and writing and had a passion for his hometown Dallas Cowboys and Texas Rangers. Morton had covered issues and events throughout the diocese, but in recent years focused much of his work in southern Delaware and Maryland’s Eastern Shore. His most recent article, a feature on a hospitality center at Jesus House Prayer and Renewal Center, appeared in the Sept. 28 issue of The Dialog. Another article, about Good Shepherd parish and school anniversary celebrations in Perryville, Maryland, appears online at thedialog.org. He also was in the process of writing additional articles for a special section planned for the Oct. 26 edition of the paper focusing on the diocesan sesquicentennial. Morton was preceded in death by his parents, Grover Dean “Salty” Morton and Anita Ray Morton of Fort Worth, Texas; one brother, Tom Morton of Boerne, Texas. He was married to Karen Reilly-Morton of Lake Mary, Florida, and is survived by his children, Kateri Morton, Michael Morton, Mark Morton, Megan Lawless and her husband, William Lawless; two grandchildren, Joseph Scruggs and Thomas Scruggs. He also is survived by six siblings, Ben Morton, Claudia Loffler, Mary Jones, Joe Morton, Cynthia Morton and John Morton.